Neptune hydraulic and mechanical diaphragm metering pumps are typically used for chemical metering in process and agricultural industries. Chemical metering pumps are available for high and low pressure applications with manual and electronic stroke control options. 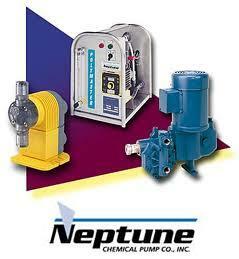 Neptune is also a manufacturer of portable, top entering propeller mixers for various applications up to 5,000 GAL. Removable check valves for cleaning without disturbing piping. Manual stroke adjustment by highly visible, brightly contrasted micrometer dial with clear, plastic corrosion protection. Extremely low maintenance requirements provide long and reliable pump operation.